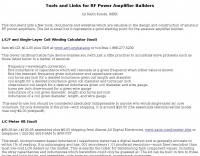 This document lists a few tools, documents and websites which are valuable in the design and construction of amateur RF power amplifiers. The list is small but it represents a good starting point for the amateur amplifier builder. The resource is currently listed in dxzone.com in 2 categories. The main category is Home brewing that is about Amateur Radio homebrew projects and experiments. This link is listed in our web site directory since Thursday Dec 11 2008, and till today "Tools and Links for RF Power Amplifier Builders" has been followed for a total of 1151 times. So far no one has rated yet, so be the first to rate this link !